So you may recall that my name is Kelly, and that I have a problem. Specifically, I went through a dark period in my life when I spent too much time and money on Craigslist, buying furniture to revamp. You saw a dresser, a desk, and a chair, and I’m pretty sure I mentioned a second dresser. 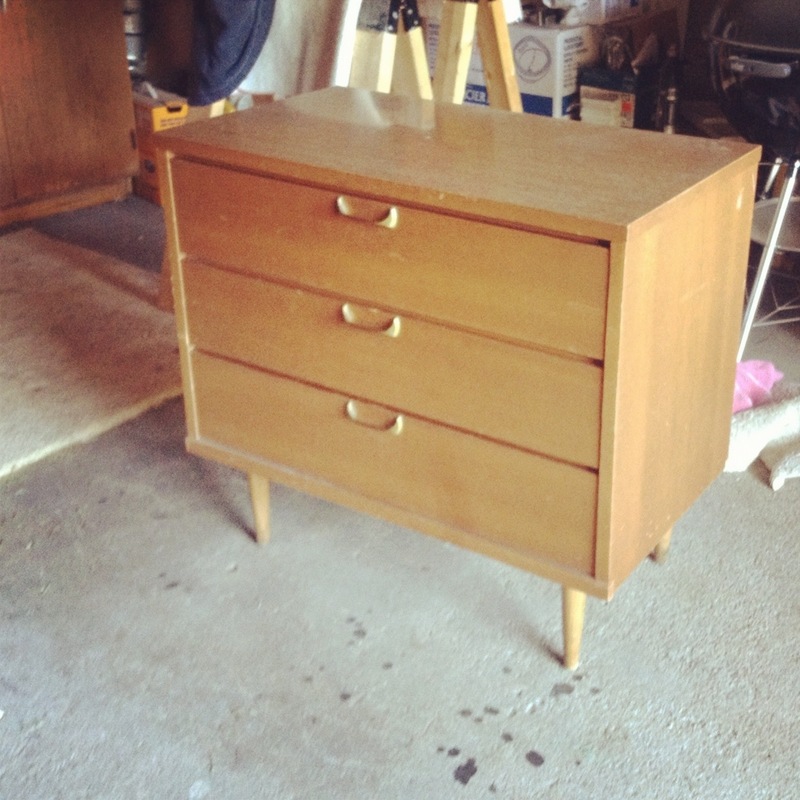 Well, for about 30 bucks in the spring, I picked up this lovely brandless mid century dresser from a young doctor who was preparing their house for a new baby and needed to shed some stuff from the space. The top was a thick laminate. Not a veneer, really, but a photograph of wood covered in plasticky varnish. Like the stock table tops your public elementary school likely had in the art room or the library. It. Was. Ugly. And not quite removable. Ok, challenge numero uno accepted. It was a nice wood veneer over the rest of the piece, which is typical for the period. But, also typical of the period was the light, almost pecan tone to the wood. Not really our taste, and almost too MCM. Challenge numero dos, accepted. 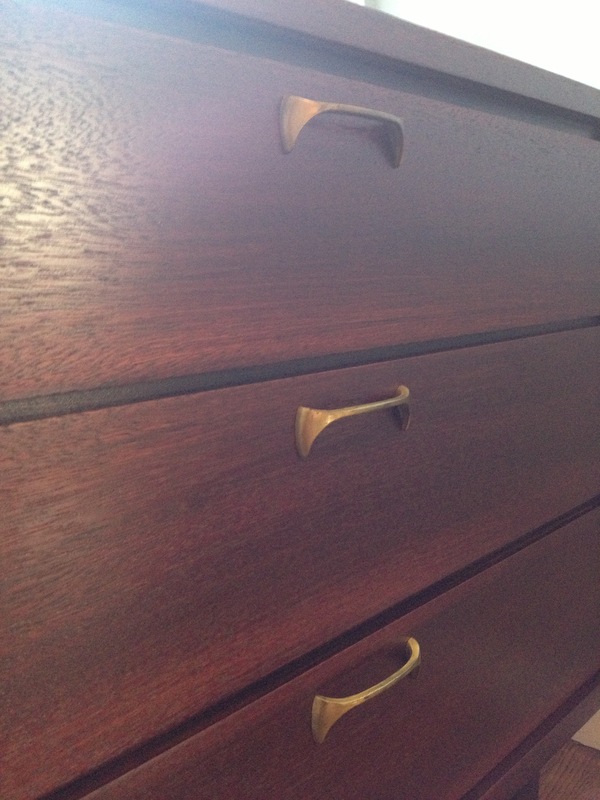 And I was iffy about the brass-ness of the pulls. Potential challenge numero tres, potentially accepted. I had grand plans to redo this baby over the summer, but I was lazy and it was le tres hot out. So it waited until like 2 weeks ago…Columbus Day weekend. Which, you’ll note, is not summer. My b. 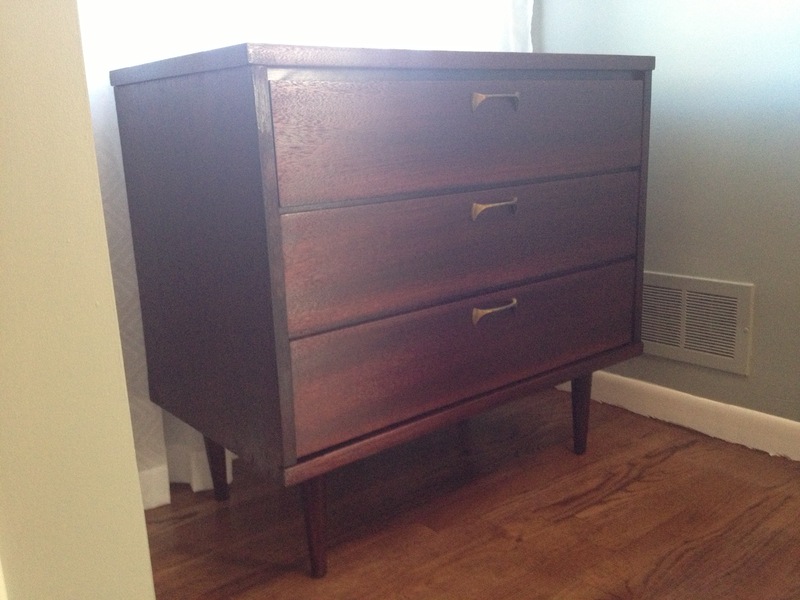 So we decided on a dark, less MCM and more traditional stain in a satin finish. I used Minwax stain and poly combo in Bombay Mahogany. 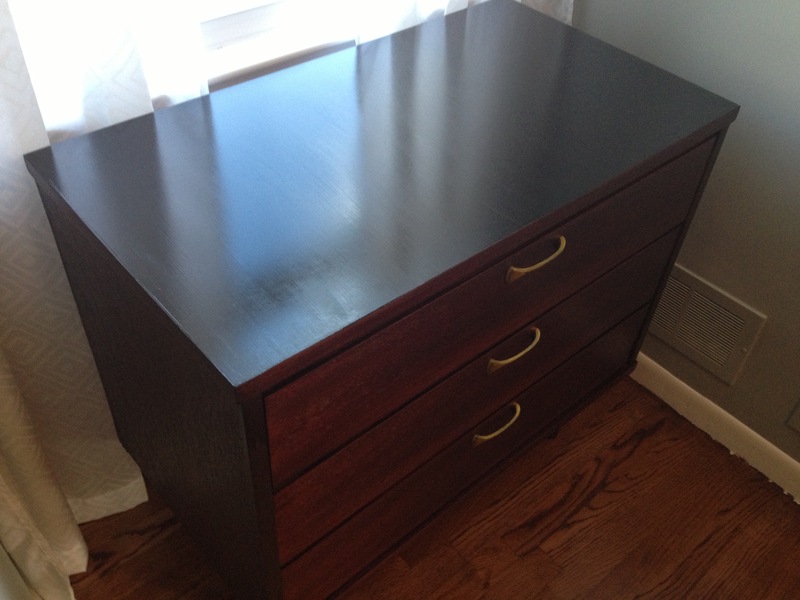 The top–which could not be removed or stained–was sanded and given two coats of Rustoleum high gloss black latex paint. It actually ended up being pretty matte, which we liked in the end. And those brasstastic pulls? Steve voted that we leave them in their weathered old state. So we did. And they are brass kickin ‘. So, the dresser is up in its nook at the top of the stairs now. It looks much better than any plaid-blanket-draped dog crate ever could. I don’t have any more Craigslist finds stashed around the house, so this ends the Tale of Kelly’s Craigslist Dresser Addiction. 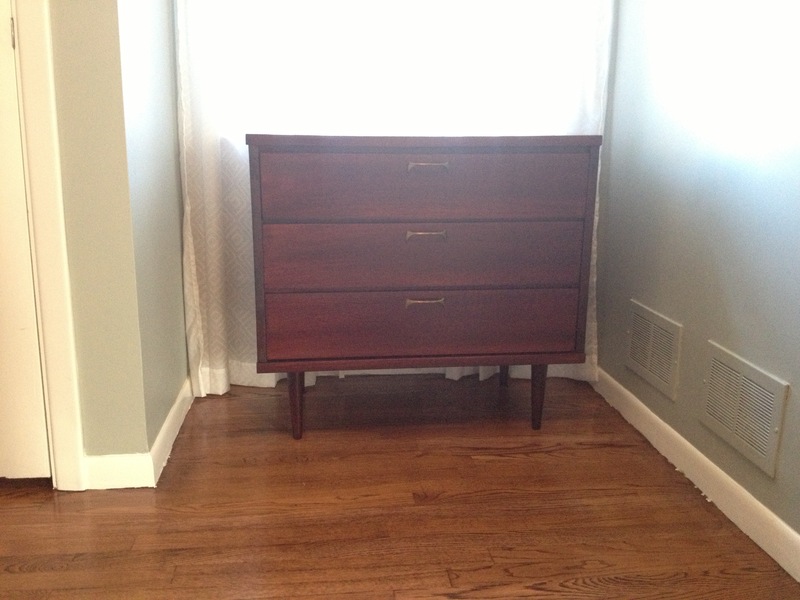 …But I do have a project planned for the lamp that will sit on this dresser. So stay tuned for that. It looks so good! Wish I had your truck/vision/motivation/talent/know.